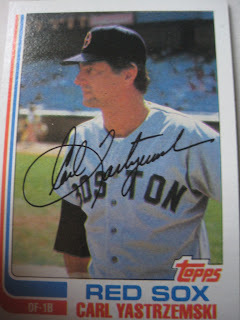 Michael Ponzini was a Topps photographer for over twenty years. He recently moved from New York to Virginia where he runs his own business, Ponzini Photography, where he shoots tourist areas and other regions of interest. He kindly shared with me some baseball cards stories. "I shot for Topps from 1981 though 2002. My first photos appeared in the 1982 set. I worked out of New York but spent much time on the road as well. In any given year I would have had photos in the sets from various locations. One year we got back from spring training and soon after hit the road again for a month long trip across the country. Topps had several other photographers in New York at the time so not everything from NY was my photo either. Many times we had two photographers at a game, one shooting from the first base side,and the other form third. From 1982 - 1985 I was also the assistant photo editor at Topps and was able to see what happened from the picture being taken to the photo selection process. As for what cards are mine, well I had a very detailed list at one point but over time it became harder to keep up with. (That Mike LaValliere rookie card a couple of posts ago is my photo). After I left my job as assistant photo editor the team inside would provide each photographer with a list at the end of the year but when they started to make way too many sets a year that became much harder to do. After awhile you were only able to positively id your posed shots. 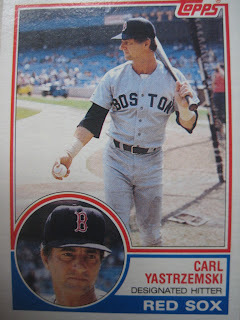 Some of my most memorable cards were Carl Yastrzemski's 1982 & 1983 regular cards and his '83 super glossy card. In September of 1981 I received four trial assignments from Topps. One of those games was a Red Sox / Yankees game at Yankee Stadium. Other than a short "hit list" my boss didn't give me many instructions for those assignments. 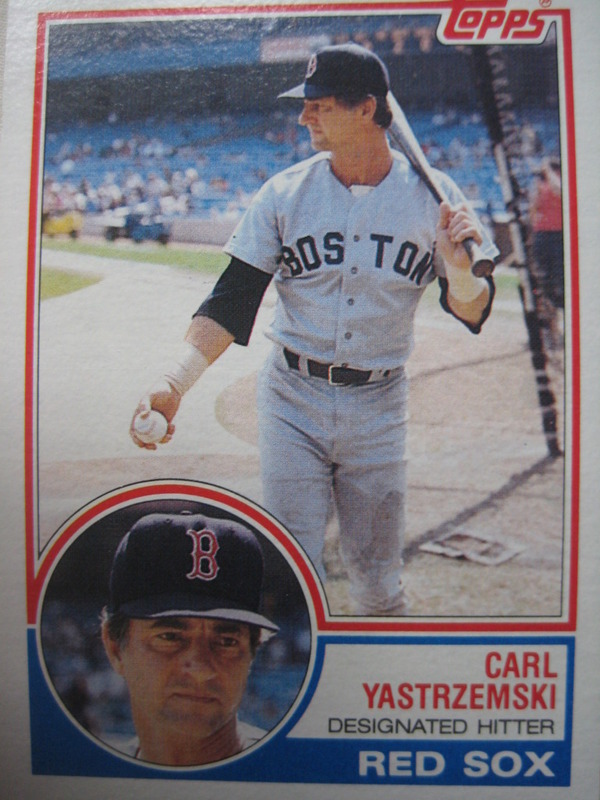 One thing he did say was to try real hard to get Yastrzemski smiling, something he said they rarely were able to do. I took this as an opportunity to prove myself and so during batting practice, while Yaz was on the field I stayed focused. He was hitting fungoes to another player in the outfield when someone must've made a joke (I wasn't close enough to hear) and he started laughing. I nailed it and felt pretty good even if it was dumb luck, being in the right spot at the right time. They used a more serious shot from that set on the 1982 card. The '83 featured one of him hitting fungoes, with a real serious head shot. 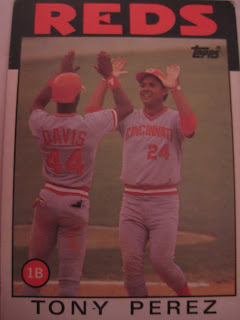 The one of him smiling finally made it to the 1983 Glossy All Star set. 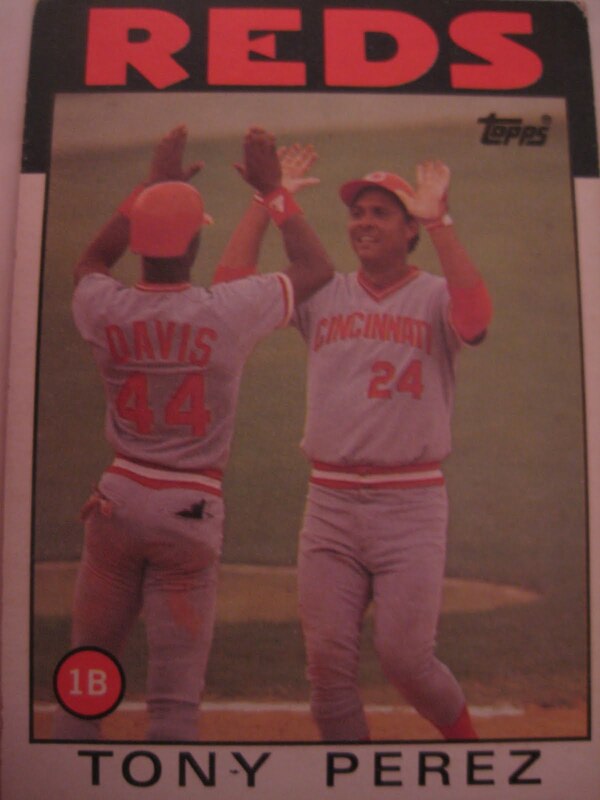 Another memorable card was the 1986 Tony Perez card. I was able to see the process from start to end on this one. Something you might have thought was so simple was not always the case. I shot this during 1985 Spring Training at Tinker Field in Orlando, Florida. Tinker was an interesting place to shoot with the photo positions being on top of the dugouts. Tony walloped a home run to left field and as he approached the plate Eric Davis was waiting for him. They high-fived and the end result was a real nice shot of the two of them as their hands clasped together. Fast forward to Brooklyn a couple of months later. The shot is selected by the Sports Department and a print is made. It looks great but the art department (who would ok or nix photos based on what they deemed was printable or not) vetoed the picture. Their argument was not based on quality but their question was "Whose card is it, Davis or Perez"? In the sports department we thought it was obvious as ED had his back to the camera and you were looking in at Perez. Well, the debate got a little heated and the head of the art department finally had to sit down with the operations boss of the sports department to quiet things down. We were passionate about our rolls and sometimes things did get, well, interesting. Fortunately, the Sports Department won that argument. That picture was always one of my favorites, even before the heated debate."